General Dynamics Itronix GD8200 I7 - bán Laptop quân đội có cổng COM dành cho dân công trình, kỹ sư, kỹ thuật. GD8200 I7-2655LE, Ram 8G, HDD 500G. Cảm ứng tay + viết. General Dynamics Itronix introduced the GD8200 in June of 2011. It is a fully rugged notebook computer and successor to/update from the company”s GD8000 model that was first announced early 2009. The new machine includes a variety of technology, performance and ruggedness updates designed to freshen up the platform while retaining complete backward compatibility with prior model infrastructures, programming and peripherals. RuggedPCReview.com ran an initial report on the GD8200 when the machine was first announced and our conclusion then was that there wasn”t much to fix on the GD8000, and so the GD8200 extends the inherent goodness of that machine, but presents it with more modern technology and a whole lot more performance (see our initial GD8200 report). We”ve now had a chance to have extended hands-on with the GD8200 and we”ve also subjected the machine to the usual battery of performance and battery benchmark tests that are part of our full review checklist. Hands-on also provides a subjective feel for a device that cannot be gleaned from just specs. The overall picture is that ruggedized notebooks such as the GD8200 represent a very mature class of machines, one that goes back almost two decades when a small number of pioneering computer makers began beefing up notebook computers to make them more suitable for work in the field. We first looked at an ancient forebear of the current GD8200 some 15 years ago when we reviewed the Itronix X-C 6000, where "X-C" stood for "Cross Country" and Itronix was a subsidiary of long-gone Telxon Corporation (they were snatched up by Symbol Technologies, which was then bought by Motorola). At the time we concluded that the GD8200”s forefather was "not likely to break, no matter how hard you use it," and the same certainly holds true for this latest machine. Things have changed considerably since then. While adequate battery life and outdoor usable displays were almost insurmountable obstacles in the dawn of rugged mobile computing, today we”re seeing notebook performance and functionality—both inside the office and out—that make conventional desktop computers increasingly obsolete. Between the latest outdoor-viewable display technology, Intel”s latest mobile processors, and the maturity of ruggedization technology, there”s hardly anything you can”t do on a notebook, anytime and anywhere. There are, however, areas where things haven”t changed. For example, the life cycle of vertical market and industrial computing technology is far longer than that of today”s near throw-away consumer products. And computers used in the field need peripherals, mounting hardware, cabling, backend systems, and often custom-designed software. Which means that the makers of such rugged mobile systems face some difficult restraints as they can”t just change the footprint of a system, or its screen size or batteries or interface standards, without also possibly obsoleting a lot of expensive peripherals and maintenance systems. The challenge then becomes to keep products technologically up-to-date without changing their basic design and appearance. Based on the well conceived XR-1/GD8000 platform, the GD8200 is therefore an evolutionary third-generation product that preserves the many qualities of its predecessors, but offers numerous smaller and larger enhancements that keep the technology up-to-date and make the machine an ever better tool for the job. 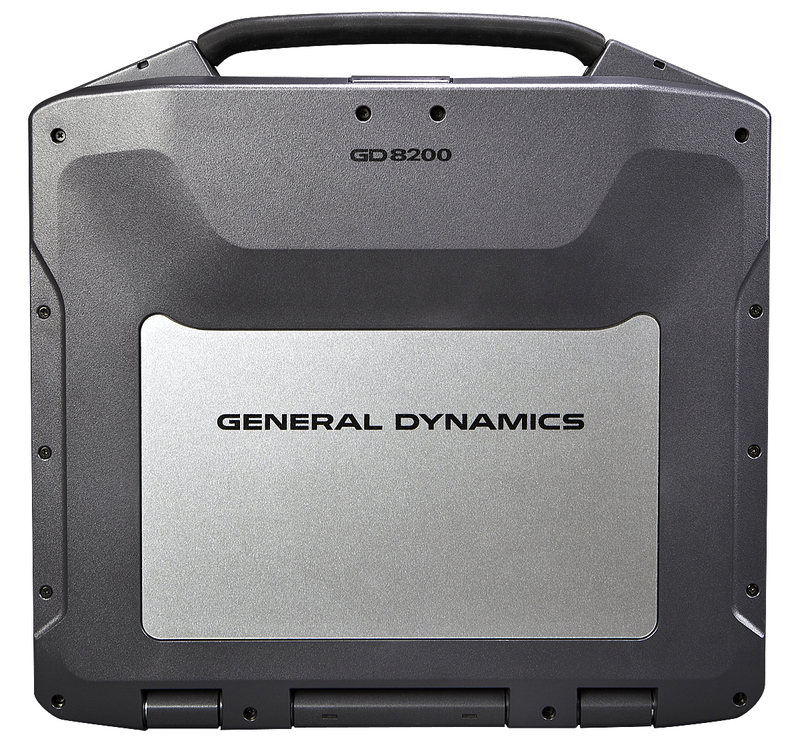 The GD8200 is also what General Dynamics Itronix calls "Fully-Rugged+," meaning the system is intended for any application that requires strong processing and wireless performance as well as maximum battery life in a design that is rugged enough for any job. For all its toughness, the GD8200 remains fairly compact, measuring 12.0 x 11.5 x 2 inches, including the generous carry handle, and weighing about eight pounds. This latest model also continues another long-standing General Dynamics Itronix tradition, that of providing excellent and utmost reliable wireless performance via integrated antenna systems for fast and accurate fixes, advanced RF shielding and noise filtering, and specially designed "CRMA" wireless modules. The GD8200 also offers good onboard connectivity and expansion potential via externally accessible card slots and a flexible-use media bay. The new GD8200 represents a major step forward in terms of performance. This is due in part to a general advance in technology, but in part also to a subtle shift in positioning. In the past Itronix generally offered the most powerful notebooks in its class, but that came at the expense of battery life. To address that, the immediate predecessor of the new GD8200, the GD8000, provided a more balanced combination of performance, ruggedness, usability and battery life via a frugal Core 2 Duo SL9400 processor running at just 1.86GHz. Perhaps that was a bit too frugal, and so the new GD8200 has an entirely more perky Core i7-2655LE under the hood. That chip, part of Intel”s 2nd gen Core i7 processor lineup, runs at 2.2GHz and can go as high as 2.9GHz in Turbo Boost mode. Intel considers this chip "low voltage," but it”s still rated at a thermal design power of 25 watts, well above the 17 watts of the GD8000”s Core 2 Duo processor. Processors aren”t everything, of course, and the GD8200”s additional technology updates include faster DDR3 memory, larger hard disks (500 or 750GB heated, up from 160/320GB), an optional 500GB hybrid drive, a USB 3.0 port (for up to 10 times the throughput of USB 2.0), Bluetooth v2.1 (reduced power consumption, increased security), and 4G support. The results are compelling. The GD8200 proved to be a stellar performer, scoring one of the highest CrystalMark totals we”ve ever seen in our years of benchmark testing. Much of this is undoubtedly due to the GD8200”s powerful i7-2655LE processor that simply smokes older Core 2 Duo-based performance. We”ve long been big fans of Intel”s Core i3/i5/i7 chips, and the second generation "Sandy Bridge" processors, of which the 2655LE is part, are better yet. As frustrating as it must be for makers of vertical market computers with their long product cycle to always quickly fall behind Intel”s much more rapid processor introductions, employing those latest processor in a product refresh can do wonders for overall performance and functionality. Taking a closer look at the benchmark results often shows puzzling numbers that don”t seem to fit in. That”s because it”s notoriously difficult for benchmarks to produce consistent, comparable results across processor and product lines and technologies. In our experience, though, the overall bottomline is almost always a good indicator of perceived performance. A couple of comments with regard to the GD8200”s performance numbers: First, note that while overall graphics performance is quite good, those who run OGL applications will miss the availability of discrete graphics. Here, the Topaz with its nVidia GeForce 8600M GT discrete graphics subsystem scored literally 10X performance compared to Intel-integrated graphics. Second, those who need every last possible ounce of performance should consider the solid state disk options, either 120 or 256GB, available for the GD8200. SSDs can speed up overall operation considerably, even over the 500GB Seagate Momentus XT hybrid drive in our review unit, albeit at extra cost and less storage capacity. But won”t battery life suffer from this hotter running chip and all that extra performance? Not according to GD-Itronix which quotes the same 8 hours of running time on a charge as for the old GD8000 machine. And if that is not enough, the GD8200”s media bay can accommodate a second (smaller 41.1 watt-hour) battery that Itronix claims boosts battery life to an astounding 12 hours. As stated earlier, the battery is the same as was used in the predecessor GD8000—a powerful 11.1 Volt, 7,200 mAH (80 watt-hour) Li-Ion pack. We ran our standard BatteryMon drawdown benchmarks to determine power draw and projected battery life. We set backlight to about 30%, just enough to still be able to read the screen, turned all the radios off, and switched to the WIndows Power Saver mode. The idle discharge rate was as low as 8.5 watts, which translates into a theoretical battery life of about nine hours. Letting the machine sit and settle down for a few minutes actually dropped draw to as little as 6.5 watts. That”s Intel Atom territory. Turning all wireless radios back on only increased draw by a watt, to about 9.5 watts, still good for almost eight hours. Which means the power draw is amazingly low. The problem with outdoor-usable notebooks is often that their screens are so bright that the battery drains quickly. The GD8200 backlight is in the 650 nits range. That”s very bright, but not as bright as some of the ultra-bright outdoor displays we”ve seen, probably because the DynaVue II technology is so good that it doesn”t need a super-bright backlight, and the benefit of that is a rather modest power draw even at full brightness: just 13.5 watts with wireless on, and that”s still good for about six hours. Switching the Windows power setting to "High Performance" raises draw to 15.5 watts. And what happens if the computer is running a processing-intensive task? We ran full 1080p video off the hard disk at full brightness, and that consumed about 19 watts, still good for almost four hours. As always, real world mileage varies. That”s due to backlight settings, processor and software power conservation, various other settings, as well as usage patterns. The GD8200 also has a DynaPower battery calibration utility that allows accurate reading of the remaining battery capacity and also periodically empties and recharges the battery to keep it at maximum performance. This can be done either through the DynaPower utility if you run Windows 7, or via a special BIOS level battery calibration procedure in the BIOS setup utility. In terms of design and execution, the GD8200 remains first class. The magnesium alloy case and internal frame and structure make for an exceedingly solid machine. It”s also a complex one with numerous carefully conceived and executed details. While some rugged tablets and notebooks are essentially clamshells consisting of an upper and lower half and a seal inbetween, the GD8200 is far more intricate, almost like a 3D puzzle. For example, it”s not obvious from the outside that the GD8200”s system unit actually consists of a meticulously sealed inner chamber with all the sensitive electronics, and then parts that are actually outside the computer (like ports, heat exchanger, antenna parts, etc.). This is why some of the GD8200”s port covers are for physical protection, and not for watertight seals. The GD8200 also has rugged good looks in sort of an industrial design meets form-follows-function way. The dark gray/light gray corporate color scheme works well, and the whole machine looks both elegant and impressive. There are no rubber bumpers, and the GD8200 apparently doesn”t need them to achieve its drop spec goals. I will say, though, that every time I hold one of these rugged high-tech marvels with their gorgeous magnesium skins in my hands, I am afraid that I may somehow scratch them and then I wonder if perhaps a simple rubber coating may not be better. One of the consequences of staying with the same footprint for several generations is that it determines screen size and aspect ratio. With virtually all notebooks now using wide-format displays, machines like the GD8200 now look tall and narrow, and the 13.3-inch diagonal display size, once considered generous, now looks a bit limited, as do the 1024 x 768 pixel XGA graphics. I am sure those are priority tradeoffs the folks at GD-Itronix often agonize over. The next two pictures show the right side (top) and the left side (bottom) of the GD8200 with all protective covers open. 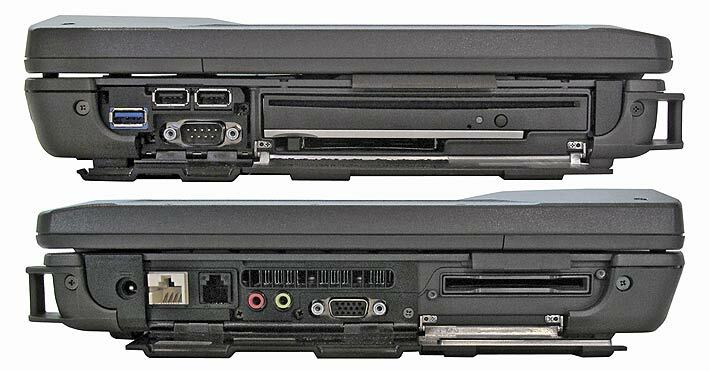 The right side has two USB 2.0 ports, a standard DB9 serial port, a media bay that can accommodate one of a variety of optical drives or a second battery and, below it, a Type II PC Card slot. New for the GD8200 is a USB 3.0 port. USB 3.0 can transmit data at up 5Gbit/s, more than ten times faster than USB 2.0, and we”re starting to see peripherals and devices that use it. On the left side are, from left to right, the power jack, an RJ45 jack for the unit”s gigabit LAN interface, an RJ11 modem port, microphone and audio-out jacks, a VGA port (with external 2048 x 1536 support), and either a Smart Card or Express Card slot. Here you can also see the unit”s cooling fan exhaust (in our testing the fan rarely ever came on). The GD8200”s 87-key sealed keyboard with individual keys is full-scale. It has off-white keys with black labels. Special keyboard functions (such as brightness, volume, screen blackout, etc.) are indicated in green symbols. The numbers on the integrated numeric keypad are purple. Below the keyboard are a properly sized and slightly recessed (so you can feel its boundaries in the dark) capacitive touchpad and two mouse buttons. Rugged notebooks often have resistive touchpads because those work in the rain and with gloves on. On the negative side, they can be hard to manipulate, and so GD-Itronix apparently decided to go with the far more versatile capacitive touchpad that actually has multi-touch capabilities. You can use multi-touch to zoom, rotate, pan in whatever software supports that functionality, and it”s also easy to scroll and even use gestures on it. The GD8200 keyboard comes either in a NiteVue glow-in-the-dark version or one that uses a standard backlight. The glow version doesn”t need a separate light, but you also can”t turn it off, which may or may not be desirable. Our tester had the backlight, which made for a pleasant and clear illumination of the keys in semi and full darkness. Since users have different keyboarpreferences, General Dynamics Itronix offers no fewer than four keyboard styles, those being, white keys/backlit, white keys/glow-in-the-dark, black keys, and black rubberized keys/backlit. Like its predecessors, the GD8200 provides field access to user-replaceable modules. The picture below shows the machine with its three backside covers, the battery, as well as the carry handle assembly removed. The WLAN/RAM compartment has a plastic cover, held in place by six small Philips screws, with a pressure seal. Inside, there are the system”s two SO-DIMM slots. The compartment also has a mini-PCIe slot that”s taken up by an Intel Centrino Advanced-N 6205 half-card. (bottom right in the picture). I wish those screws were somehow secured so that they cannot get lost. The cover is clearly marked with "RAM" and "WLAN". The cover also provides easy field access to the GD8200”s two DDR3 memory modules. Unlike in most systems, here the memory is protected and shielded additionally by a meticulously engineered metal cover. The cover to the CRMA wireless compartment (middle right in the above picture) may cause a bit of alarm as it appears to have air vents and seemingly unsealed connectors for external WWAN and WLAN antennas. Looks deceive, though, as the metal CRMA cover actually has a pressure seal around the CRMA bay cutout, and another pressure seal around the antenna ports. Yes, pressure seals are always a bit vulnerable, but as long as they are well maintained, GD-Itronix came up with an elegant solution here. The vented part is actually technically outside of the sealed interior of the computer. A third door (bottom left) covers the hard disk compartment. In order to open it you need to twist two rotating latch mechanisms. Each latch is additionally held in place with a Philips screw that must be removed before the latch can be rotated. Why not just use screws? Because in certain situations it may be necessary to quickly remove the hard disk without first locating a screw driver and messing with tiny screws. If that is the case, then the little screws are not used. If it”s not necessary, put the screws in for additional security. The hard disk itself is mounted inside the caddy in a separate suspension systems that uses vibration and impact resistant material made of a high-performance thermoplastic that maintains its vibration isolating and dampening properties in all temperatures. There is also a spindle heater inside that warms the hard disk before it spins up in temperatures below 5 degrees Fahrenheit, which is the minimum safe operating temperature for the hard disk. If it”s colder, you”ll get a message informing you that the hard disk is being warmed before booting or resuming operation. The whole assembly is about as intricate, well-thought-out, and meticulously designed and engineered a protective hard disk enclosure as we”ve seen, and it”s considerably more advanced a solution than most we”ve seen. The disk itself in our unit was a 500GB Seagate Momentus XT Solid State Hybrid Drive, a best-of-both-world design that consists of a 7200-RPM hard drive with 32MB of cache, 4GB of solid state SLC NAND flash storage and Adaptive Memory technology. Rugged notebooks like the GD8200 will be used outdoors and often in bright sunlight. Most of the standard transmissive LCD displays used in consumer notebooks, however, wash out in daylight, and that”s why over the past few years, sunlight-readability has become a major selling point in the rugged notebook sector. It was General Dynamics Itronix that rang in the era of truly outdoor-viewable displays a few years ago with their DynaVue technology that cleverly combined a strong backlight with optical properties that reduced the reflection of ambient light, therefore retaining enough screen contrast to keep the display viewable. RuggedPCReview technology editor Geoff Walker explained the principles involved as follows: "There are really only two practical methods of making a notebook screen readable outdoors: (a) crank up the brightness (measured in nits, which is display-industry slang for "candela per meter squared", or cd/m2) to the point where the light emitted by the screen is sufficiently greater than the ambient light reflected by the screen, or (b) treat the surface of the screen so it reflects much less light, which again allows the emitted light to exceed the reflected light." For discussions of the technology, see GD”s "Rugged Notebook Display Viewability, and Walker”s GD-Itronix DynaVue Display Technology. I recall being extremely impressed when I first saw a GD-Itronix machine with a DynaVue screen. The technology was so compelling that all major rugged notebook makers have introduced their own versions, with generally good success. The GD8200 specs now refer to a new version II of the DynaVue technology that increases brightness marginally from 500 nits to 650 nits and includes new polarizing films that, according to GD-Itronix, further improve outdoor viewability by approximately 35% as measured in accordance with MIL-STD-3009. The pictures below are a comparison between the 13.3-inch DynaVue GD8200 screen on the right and the standard 12.1-inch display used in an older Itronix product, the specialty "Hummer" version of the GoBook VR-1. Both have touch-screens. Indoors both screens perform well, but outdoors the difference is dramatic. Both images were shot in bright California daylight, with the computers sitting side by side. As dramatic as the difference between the pictures is, it again does not totally reflect what you actually see with your eyes. Screens are notoriously difficult to photograph, and what shows up on the CCD of a camera does not do reality justice. The GD8200 screen actually looks better and more life-like than what the camera captured, but the image accurately shows the great difference in glare, reflection and contrast between the GD8200”s DynaVue screen and the older model”s display. The first picture compares the two displays in bright daylight, but in the shade. Head-on, both displays are readable, but the GD8200 screen with a more powerful 650 nits backlight and DynaVue II appears significantly brighter and more vibrant. The second picture below shows the displays from an angle, and here you can see the importance of proper anti-glare treatment. The older display”s matte surface diffuses the light so much that the screen becomes milky and almost unreadable. The DynaVue display displays no milkiness, but its much glossier display surface does show some reflections that”d we”d like to see totally controlled. The third picture below shows the two computers in broad sunlight. Here, the older non-DynaVue display becomes milky and basically unreadable whereas the DynaVue display remains amazingly vibrant with good contrast and rich color. Is DynaVue perfect as an outdoor display technology? No, but it is still pretty much as good as it currently gets. The competition has been catching up over the past few years. Some offer brighter backlights to crank up contrast outdoors, but unless properly managed wiith automated backlight control, that can quickly drain the battery. Some by now better control distracting reflections, and that”s probably the one thing GD-Itronix should concentrate on for the next evolution of DynaVue. Note that in bright sunlight no current transmissive display technology can come close to provide book or magazine like contrast as current displays are not paper-white, and at times you may have to move or tilt the screen to avoid reflections. RuggedPCReview.com recently examined an emerging display technology (Pixel Chi, see here) that can provide almost perfect outdoor contrast, but at the expense of morphing from color to black and white (sort of like an Amazon Kindle). Overall, the GD8200”s DynaVue display is impressive, especially considering that it incorporates a touch screen, something which usually cuts brightness and readability (and also introduces some of the reflections we criticized). Compared to rival technologies, DynaVue colors seem richer and deeper, and the new version appears to have noticeably less of the blue-greenish cast that we observed in the initial version. We”re still not totally pleased with the latest version”s LCD”s viewing angle. We”ve become so used to the almost 180-degree viewing angle both vertically and horizontally in most premium Tablet PCs that we no longer expect anything less. Viewing angle remains a bit of an issue with the GD8200 display. It is wide horizontally but there are some color shifts where grays turn to yellow when looked at from the right. The vertical angle seems improved compared to older versions, but there are also still color and contrast shifts. Our GD8200 came with a resistive touch screen that can be operated either with a supplied plastic stylus or with a finger. The resistive touch panel controller now communicates with the processor via a USB connection (prior versions used serial) and is quick and responsive. The machine comes with a special touch screen utility control panel for adjusting, calibrating and optimizing the screen for accurate touch performance, ease of use, and special configurations. The image below shows three of the utility”s seven panels. Display (left screen in above picture) lets you map the touch screen in various ways. You can enable multiple displays and you can also map the touch screen to only part of the display. There may be applications where it comes in handy to have only the bottom part respond to touch, and the GD8200 lets you do that. You can even create a customized area anywhere on the display and set it so only that area responds to touch. This is ideal for custom software applications. Edge Compensation (center screen in above picture) can be very valuable for those who use the stylus a lot. With touch screens and digitizers it”s often difficult to touch or select items at the edge of the panel, and especially so when the LCD display runs all the way to the kind of thick protective bezel some rugged computers have. The GD8200 touch panel allows you to precisely define edge compensation for all four sides, i.e., set it so the cursor thinks the edge is either farther away or closer in. Precise configuration can make for optimal usability and responsiveness in touch applications. Tools shows a linearization curve, lets you verify touch accuracy, and lets you do and clear linearization parameters. Setting (right screen in above picture) lets you set linearization either to nine or 25 points, with 25 points offering maximum accuracy. You can also set double click time and area, beeps, auto right click, cursor stabilization, and five different mouse modes (like click on touch, click on release and so on) according to personal preference. If you intend to use the computer primarily with finger touch, you can set it so that the driver stops reporting points when movement is within a pre-defined range. This way the cursor will not jitter around when the same point is touched again or when you move a pen within a small area. Note that this is conventional resistive touch technology that works best with a stylus. There is little resemblance in functionality with the capacitive multi-touch technology now used in media tablets such as the Apple iPad. In rugged notebooks like the GD8200, resistive touch is best used for custom software applications where users can manipulate the screen with a quick touch rather than using cursors or the unit”s touchpad. GD-Itronix actually included some Tablet PC software such as Microsoft Journal, the very useful Snipping Tool, a math input panel, and the standard Microsoft Input Panel. Unfortunately, despite the faster USB touch screen, ink goes on haltingly in the Input Panel, reducing its functionality. GD-Itronix was an early supporter and provider of state-of-the-art integrated wireless with optimal performance and signal reception. They leave nothing to chance. The GD8200 can support up to four integrated radios: WLAN, WWAN, GPS and WPAN. The WiFi module in our tester was an Intel Centrino Advanced-N 6205 Mini Card, a 802.11a/b/g/n wireless network adapter that operates in both the 2.4 GHz and 5.0 GHz spectra. The adapter delivers up to 300 Mbps of bandwidth in n mode via features such as MIMO technology, 40 MHz Channel support, and Packet Aggregation. This is also a module that has optimized power modes and uses sleep states to reduce power consumption when the module isn”t active. The module also offers on-board diversity support for systems like the GD8200 that are designed with two antennas. At this point, CRMA modules may support the 3G GSM HSPA+ (High-Speed Packet Access) protocol, the EDGE (Enhanced Data rates for Global Evolution) network for GSM/GPRS/EDGE networks, the GSM-based UMTS (Universal Mobile Telecommunications Systems) also referred to as W-CDMA, or EV-DO/1xRTT/CDMA. New for the GD8200 is 4G LTE support in areas where it is available. Also new for the GD8200 is class 1 Bluetooth v2.1 instead of v2.0. Why is that important? Because while the older Bluetooth v2.0 standard is rated at the same nominal 3 Mbit/second speed, version 2.1 reduces power consumption and includes secure simple pairing (SSP). SSP not only improves the Bluetooth "pairing" process between devices but, much more importantly, increases the use and strength of security. Unlike the "legacy" pairing process of BT 2.0, 2.1 uses public key cryptography and mandatory, reliable, non-expiring encryption that precludes electronic "eaves-dropping," a potentially significant advantage for a secure device. Signal reception is a huge issue for computers that are used in the field and on the road where they are often operating at the fringe of radio signal coverage. This makes superior antenna performance mandatory. The GD8200 uses several internal antennas, located in various parts of the machine, for greater range, superior coverage area, and optimal reception. And since the GD8200 may be used in military and other applications that require complete radio silence, all radios can be turned off instantly via a hardware slider switch located right above the keyboard. As far as ruggedness goes, there”s an arms race going on out there as more competitors are entering the lucrative, albeit difficult to crack, rugged mobile computing field. We”ve been seeing a trend towards not only increased ruggedness, but also more testing to document ruggedness. How does the GD8200 measure up? Real world impact resistance -- Computers do drop. The DOD estimates a piece of equipment will be dropped from heights up to four feet an average of four to six times during its life cycle. Most rugged vendors use the drop test procedures described in MIL-STD-810F and 810G that mandate 26 drops (one on each edge, surface and corner). But that is with the computer turned off, and the test actually allows using five units to make it through the entire test. This hardly shows how well a single unit will do. On top, many units are dropped while in use, and not while they are off. To make the test more realistic, GD-Itronix did the drop test with the computer on and with rotating media instead of solid state memory, as that is the most common configuration, and to do it with a single machine as a user in the field won”t have five machines to pick from. The computer passed the test, with power on, from a drop height of 48 inches, and with a single machine, thus exceeding the MIL-SPEC requirement. Real world sealing -- The degree of protection against dust and water is usually given in an IP (ingress protection) rating. Again, GD-Itronix felt the commonly used testing methods didn”t make much sense. Most units fail as a result of being "washed off", i.e. subjected to a LOT of water, or as a result of being rained on, which means less water but potentially over a long period of time. To make this test more meaningful, in addition to the ANSI/IEC Ingress Protection test, they subjected the unit to the test procedure described in MIL-STD-810F 506.4 Procedure II, which mandates a full four hours of exposure to dripping water, and not just the 15 minutes in the often-used Procedure III. Many rugged machines claim IP54 ingress protection, but GD-Itronix felt that since the 5" still allowed limited dust penetration, they redesigned the sealing to achieve full IP64 protection, i.e. no dust penetration at all. Additional improvements in sealing bumped that up to the GD8200”s current IP65 rating, where the "5" means protection against low pressure water jets from all directions. According to GD-Itronix, the GD8200 also passed an operating test to simulate extreme rain and wind with 5.8" rain per hour blown at 70,ph for three hours. The GD8200, of course, was also tested for vibration, extreme temperatures, altitude, humidity, and so on. The GD8200 press materials include a reference to "40% more testing," which we assume refers to items such as explosive atmosphere, fluid contamination, solar radiation, fungus, gunfire shock, etc. As always, for specific ruggedness testing results, refer to the manufacturer. Like almost all modern computers, the GD8200 offers several physical and software security measures. There is a swipe style solid-state fingerprint reader located to the right of the touchpad. Biometric fingerprint scanning is very effective and can be used to complement, reduce or eliminate multiple passwords. The GD8200”s BIOS also offers an unusually extensive set of customization options on top of what you usually get in the BIOS setup. Stealth mode, for example, lets you boot with the LED lights, fan, audio, system beeps, and radios individually turned on or off, and with the backlight initially off. You can also individually disable hardware that could be used to transfer data, such as PC Cards, the optical drive, LAN, wireless radios, and com/USB ports. With all this security, don”t forget to get a simple Kensington locking cable for use with the Kensington lock slot on the GD8200. 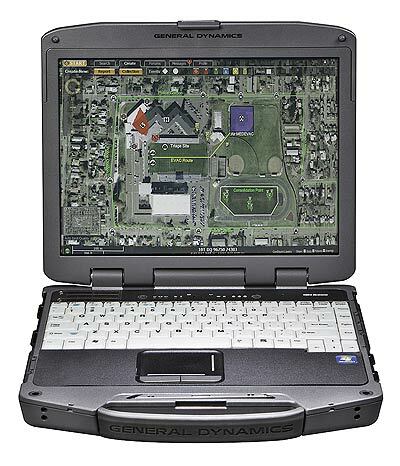 The General Dynamics Itronix GD8200 is a fully rugged 8-pound notebook computer that once again offers significantly better performance at no penalty to battery life compared to its predecessor, the GD8000. It also offers improved sealing while still taking advantage of the inherent quality and reliability of its evolved XR-1/GD8000 platform, but offers state-of-the-art performance with a powerful, yet very efficient and cool-running 2.20GHz Intel Core i7-2665LE processor. The 13.3-inch 4:3 aspect ratio LCD with 1024 x 768 pixel XGA resolution remains and now looks a bit tall and boxy, but thanks to the DynaVue II technology, there is very good outdoor viewability of the touch screen display. DynaVue II makes it possible to see a deep, rich image on the GD8200”s display in almost any lighting condition, one that doesn”t completely wash out even in direct sunlight. Wireless performance, now enhanced with available 4G LTE, is strong due to an integrated quadra-helix antenna system for fast and accurate fixes, and the company”s CRMA Express wireless modules. There is good onboard connectivity as well as expansion potential via externally accessible card slots (PC Card and Express Card or Smart Card) and a media bay that can accommodate an optical drive or a second battery. Current customers will appreciate the new model”s full compatibility with all prior XR-1 and GD8000 docks and peripherals, and the excellent performance and various technology upgrades and improvements of the GD8200 are strong upgrade and expansion incentives. Both new and existing customers will find in the GD8200 an expertly designed, engineered and manufactured machine that provides very strong performance and good battery life for use in even the most environmentally demanding environments.